Walks 113 & 114 weren't recorded. Walks 122 & 123 weren't recorded. A glimpse of the River Test from the dismantled railway near Leckford. On Sunday 13th July we walked the third section of the Test Way. This section was from West Down (near Chilbolton) to Awbridge (near Romsey). As this was a linear walk, we initially met up at Awbridge, where we left two of the cars and we all travelled in the other two cars to West Down, where the walk started. The walk started by heading south along the course of a dismantled railway, which made up a large proportion of this walk. Dismantled railways are very straight and flat, which makes them popular with walkers and cyclists, of which we met quite a few on our way. This one was lined with trees and gave the impression of a long green, and slightly monotonous, corridor. 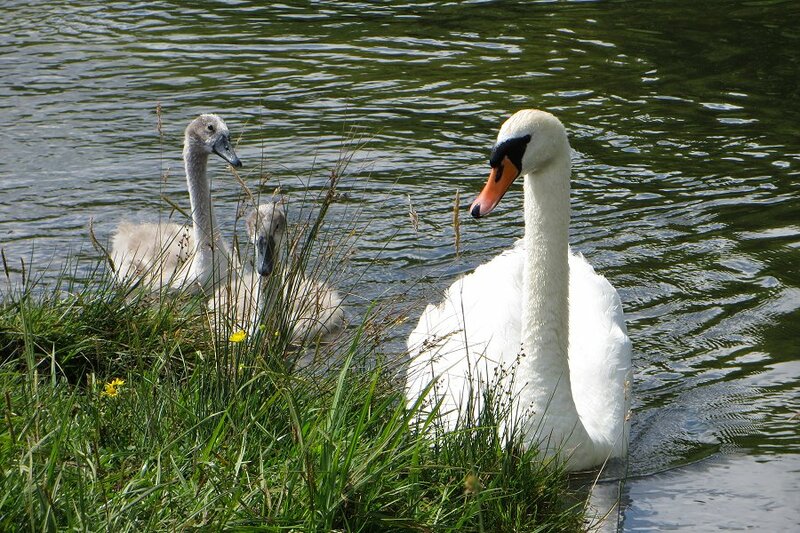 A swan and cygnets on Marshcourt River, just south of Stockbridge. The Test Way passes by Stockbridge, but we decided to make a detour into this picturesque town. In amongst the lovely old buildings that make up the High Street, there are openings where you can see parts of the River Test, which flows underneath the High Street itself. We saw several large trout in one of the channels. From Stockbridge, we made our way into Common Marsh, a National Trust wildlife park, where we saw swans and cygnets in the river and horses on the common. After our pleasant diversion, we re-joined the Test Way and continued following the course of the dismantled railway. Some horses being pestered by flies on Common Marsh, south of Stockbridge. We stopped for lunch on a sunny grass verge where the path had opened up a bit. 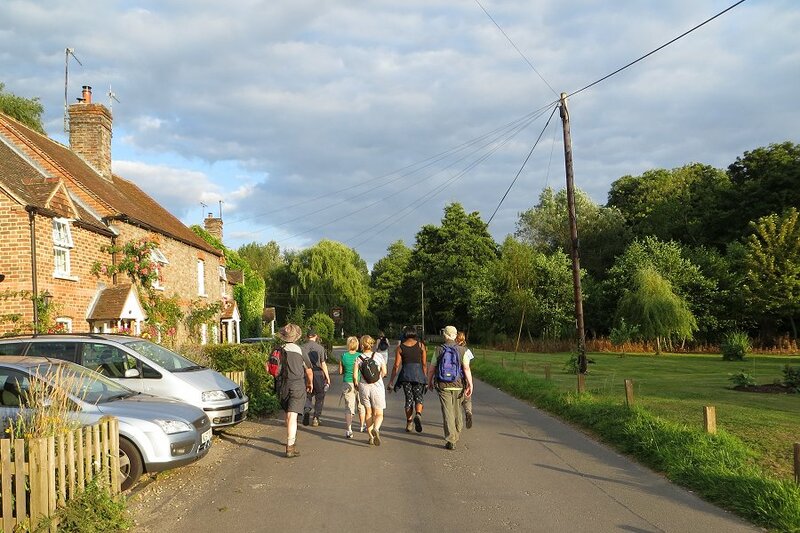 When the picnic was over, we continued along the Test Way until we reached the small village of Horsebridge, at the half-way point of our walk. Here we stopped at the local pub for a pleasant drink. On leaving the pub we passed a private garden that contained some remnants of Horsebridge Railway Station, which was closed down 50 years ago. There was a short section of track with a single 1920's railway carriage on it, a platform, an old-fashioned signal mast, and a signal box that had been converted into an interesting summer-house. A bridge over the River Test at Lower Brook. 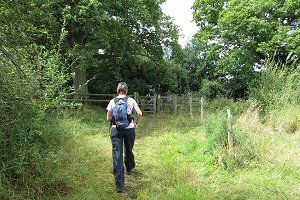 We left the course of the dismantled railway at Lower Brook and took to more conventional country footpaths that crossed the Test and circumnavigated Mottisfont Abbey. From there we continued cross country to Kimbridge. The small hills we encountered on the way seemed very noticeable after the long flat route that we had taken so far. 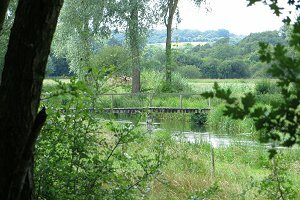 We took another detour to look at the River Test once more before making our way along a quiet lane to Awbridge where the walk ended. See our route on Bing Maps. Those with cars at West Down were taken back in one of the cars that we'd originally left at Awbridge. We'd escaped the predicted rain and had enjoyed a fair amount of blue sky and sunshine. The detours we'd taken had added over a mile to the total walking distance but were well worth it to add more interest to the walk. We will be doing the final part of the Test Way is in August. Crossing Snelsmore Common at the start of our walk. Tuesday 29th July was another warm day, with temperatures reaching 27°C, so the cool of the evening was a good time for a short walk. Thirteen of us (including a couple of visitors from the Oxfordshire group and one from the Berkshire Walkers 20s & 30s group) gathered at Snelsmore Common Country Park for this 3½ mile evening walk. 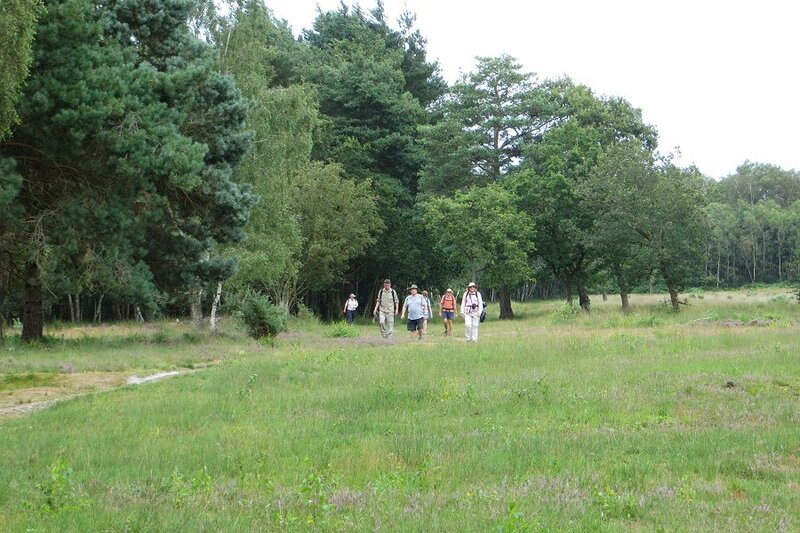 We started off by heading south-west into Snelsmore Common, a mixture of woodland and heathland. The recent long spell of warm weather meant that the usually muddy footpaths were completely dry. Entering the village of Bagnor on our way to the Blackbird pub. We left the common on a footpath between farmland and a golf course, heading south toward the village of Bagnor. Although the leader had not planned to stop here, the group persuaded her that there was time for a swift half at the Blackbird pub. 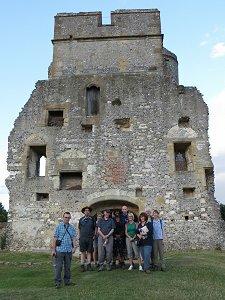 A group photo at Donnington Castle. Suitably refreshed, we continued our route by heading east and crossing a bridge over the A34 Newbury Bypass, which took us to the ruins of Donnington Castle. The twin-towered gatehouse is all that remains of this 14th century castle, apart for the earthwork around it. We stopped to admire the castle and the views of Newbury it commands before continuing our walk by heading north-east and crossing the A34 on another bridge. Heading north past the golf course once again, we re-entered Snelsmore Common Country Park and made our way back to the cars, with half-an-hour of daylight to spare. See our route on Bing Maps. 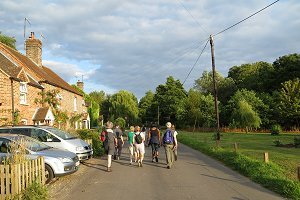 As there was still some of the evening left, most of us went on to another pub, The Castle, which was a mile or so down the road and - guess what - close to Donnington Castle. 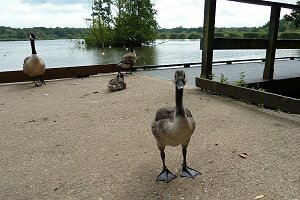 Canada Geese at Fleet Pond, including an inquisitive juvenile. Setting off from the station, we followed the footpath that traces the western shore of the pond. This has a few jetties allowing a better view of the pond and its wildlife. 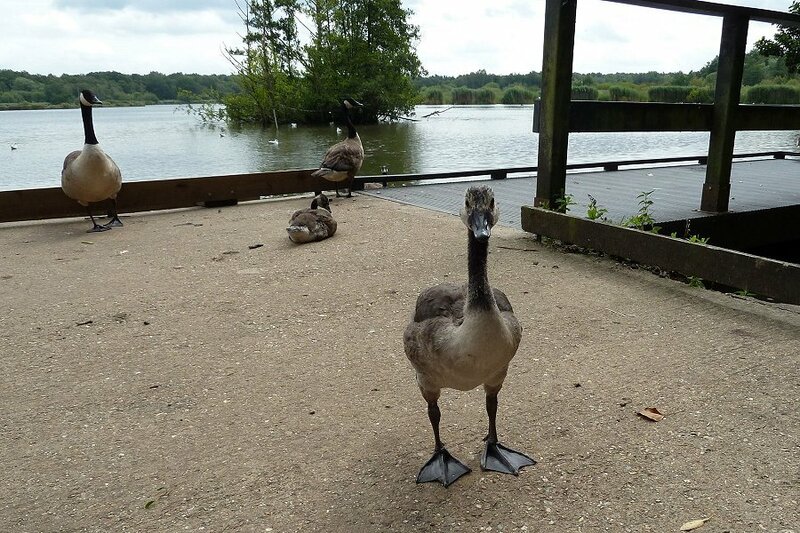 We stopped at one of the jetties for a look and were greeted by Canada Geese, including some inquisitive juveniles. Following a footpath by the stream that feeds Fleet Pond from the canal. We followed the edge of the pond to the southern-most point which the locals call the beach on account of its high sand content. It's not the sort of beach where you'd go paddling as the only swimmers we saw were dogs and wild fowl. There is a stream that feeds the pond from a sluice on the Basingstoke Canal about a mile south. We followed the stream through woodland until we emerged at the sluice gate on the canal. From there we followed the canal towpath heading west towards Fleet. Along the way we saw a family of Moorhens preening themselves on some water-lilies. Following a footpath near Pyestock Hill. We left the canal by the A323 road bridge and followed a long straight path through the Forest of Eversley. Stopping in the woods for our picnic lunch, we found a convenient fallen tree to sit on. After lunch we went straight to a local pub. Well, we actually went straight past the pub to start with until I corrected my navigational error! Suitably refreshed, we left the pub to be confronted with another group of walkers just arriving. Obviously this is a popular spot for walkers. Anyway, we headed north-east along another forest path, which brought us out onto a large roundabout on the A323. Common land near Fleet Pond. We crossed the Basingstoke Canal again, this time heading north, and then back into woodland at Pyestock Hill. 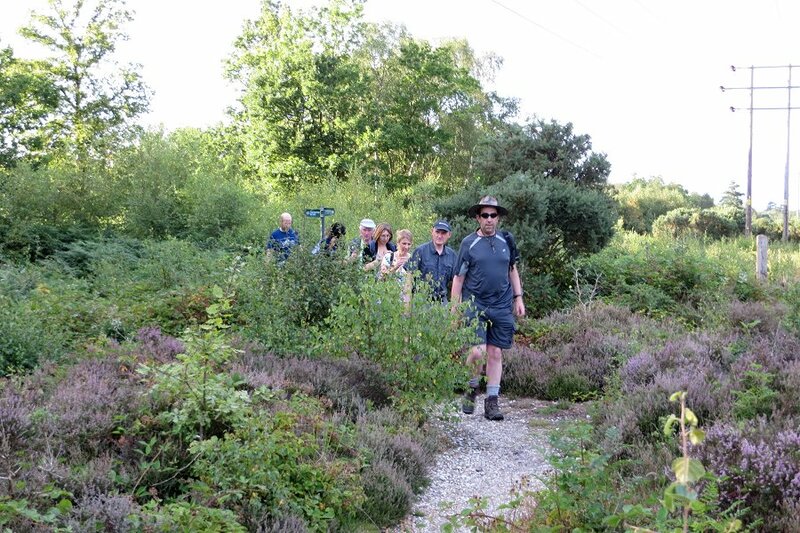 Following a well-made path through woodland and open heathland, we made our way north toward the railway line, where we turned westward and headed back toward Fleet Pond. On reaching the north-east corner of the pond, we followed the path across the northern edge of the pond back to where we had started the walk. See our route on Bing Maps. I'd chosen this walk because I thought the amount of tree-cover it offered would be helpful in this spell of hot weather. (Last Saturday we had temperatures of 28°C.) However, the hot weather seems to have abated and we only had a high of 21°C today. We also had a few showers so the shelter of the trees came in useful after all. 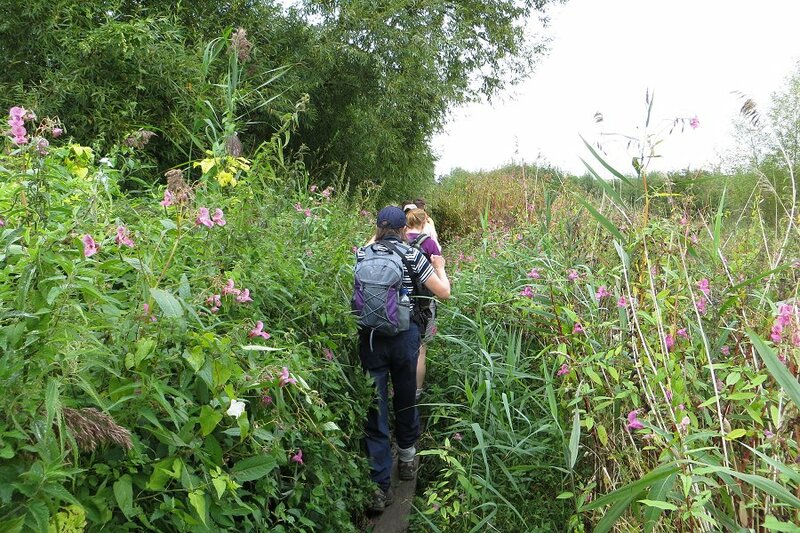 Following the Blackwater Valley Path by the Gravel Pits. Eleven of us (including two newcomers) met on Saturday 16th August at the car park behind the shops on Finchampstead Road near the intersection with Nine Mile Ride. We set off following the road past the shops and along Nine Mile Ride for a short distance before heading down Wick Hill Lane. This gravel road passed through woodlands and a couple of farms before emerging onto the busy B3348 road. We crossed this road to take a quiet side road down to the bottom of Finchampstead Ridges. Then we took a path up into the woodland of the Ridges, which curved round and back out again further along. On Longwater Lane, heading into Finchampstead. 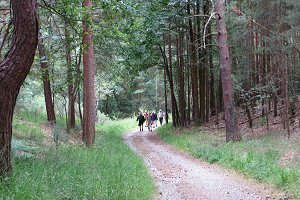 We emerged from Finchampstead Ridges onto a footpath that took us south past Hall Farm and onto a minor road north of Moor Green Lakes, which we followed west before taking a footpath down between the lakes. This area is a nature reserve and I saw numerous bird boxes attached to the trees that lined the path. These were all of different shapes and sizes, probably to allow a variety of different birds to nest there. Our path joined the Blackwater Valley Path, heading west along the edge of the sand and gravel pits, with their conveyor belts silent and still for the weekend. 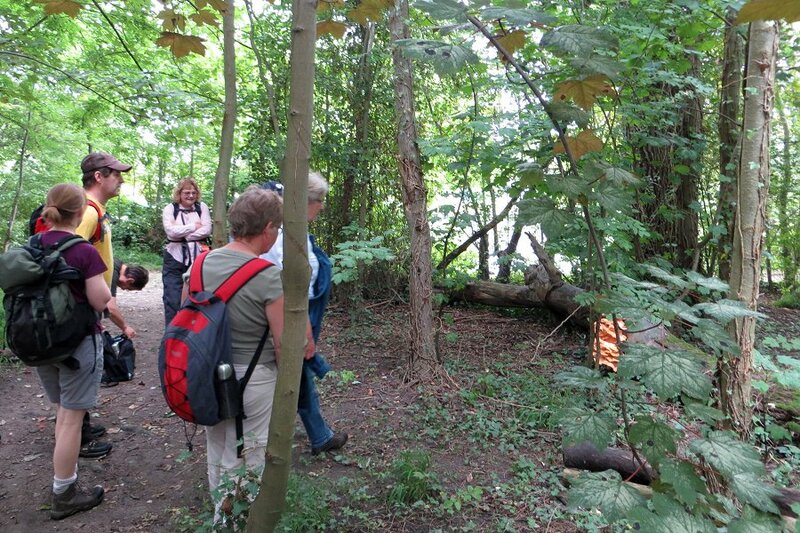 We came across several birdwatchers along the path, one of which told us of what they had seen today. 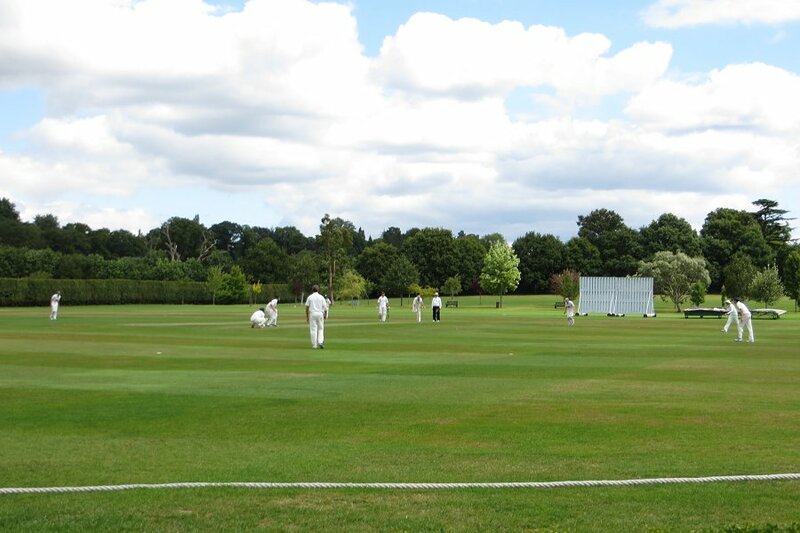 Watching a game of cricket while having lunch in Finchampstead. 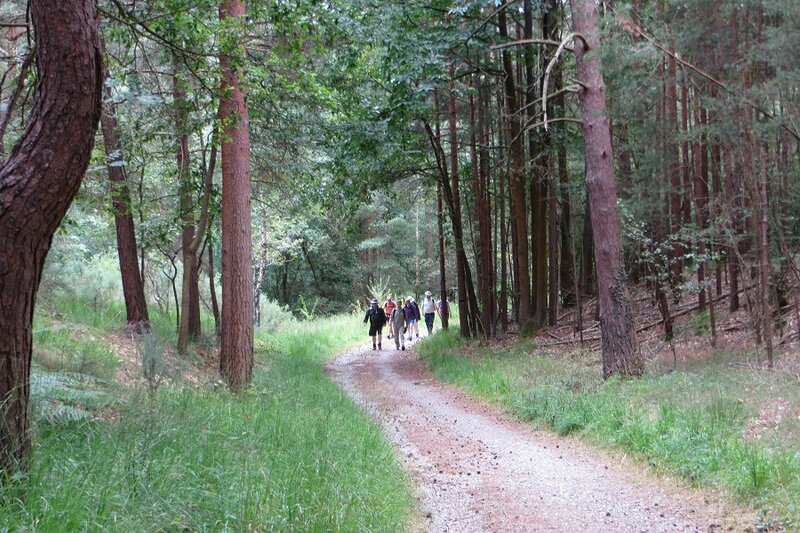 Leaving the lakes and crossing the B3016, we continued west and then north into Finchampstead on Longwater Lane. Another footpath took us north to cross the B3348 again and into Finchampstead Park, the home of Finchampstead Cricket Club. We stopped here to have our picnic lunch. It was very pleasant to sit at the picnic tables and watch a match being played while we ate our sandwiches. After lunch we skirted round the edge of the cricket pitch and joined a footpath heading north to the Queen's Oak pub. This 16th century inn is named after an oak tree planted in 1887 to mark the Golden Jubilee of Queen Victoria. This tree lasted until 2003 but a new oak tree was planted nearby to celebrate the Golden Jubilee of Queen Elizabeth II. Young Oak tree planted to celebrate the Golden Jubilee of Queen Elizabeth II. We stopped at the pub for a drink. There had been a wedding in the church opposite the pub and now there was a large party of very smartly dressed people enjoying a drink or two at the pub. I'm not sure how well we blended in. Once we'd finished our drinks we set off north again and crossed Nine Mile Ride as we entered California Country Park. Here we circumnavigated Longmoor Lake before stopping at the café for tea and cake. Suitably refreshed, we left the park and followed Nine Mile Ride back to the car park where we had started. See our route on Bing Maps. 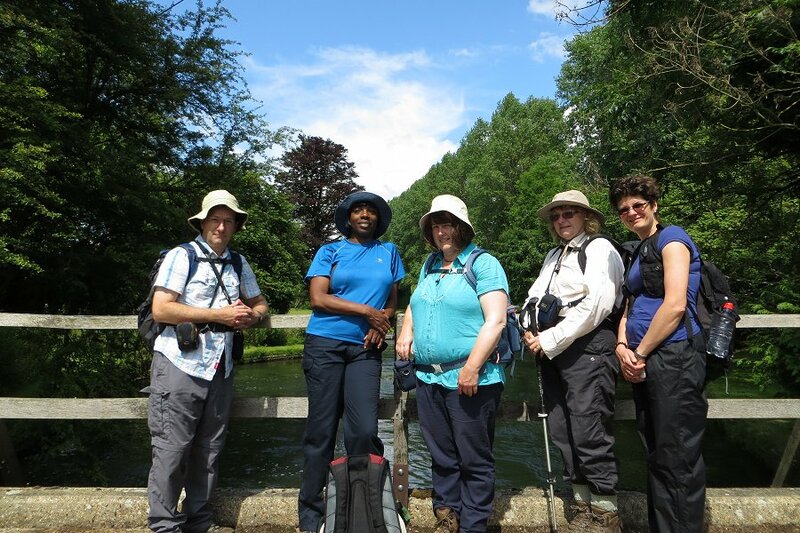 This is the first walk that Kathy and Ann have led for us and it was most pleasant, with a wide range of scenery including woodland, farmland, lakes, and a cricket match. We were spoiled by having a tea and cake stop as well as the more usual pub stop - and even the weather was on good behaviour. They are leading another walk in September. I'm looking forward to that! Walking through Benyon's Inclosure near Mortimer West End. 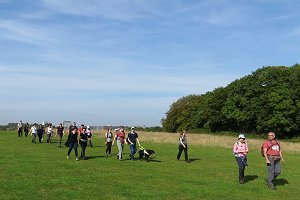 On Sunday 24th September, thirty-six of us met up in the English Heritage car park near Silchester. This large number was the product of a joint walk with the Surrey Area Weekend Walkers (SAWW), the Surrey and Beyond Ramblers group (SABRE) and us. About half of the people there were our group plus one from the Berkshire Walkers 20s & 30s group and two newcomers. We set off heading north, toward Mortimer West End. 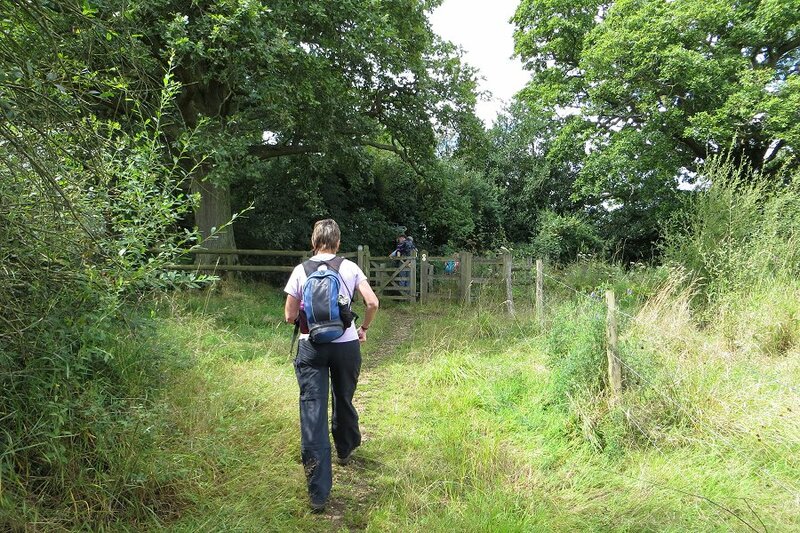 A combination of byways and lanes took us to main road between Aldermaston and Mortimer. 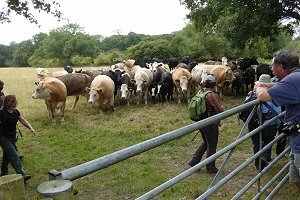 We followed this west for a short distance before entering Benyon's Inclosure, an area of managed forest north of Silchester. Kiln Pond in Benyon's Inclosure near Silchester. 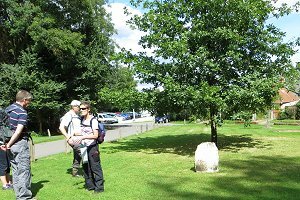 After passing the picturesque Kiln Pond, we emerged from the forest into Silchester, just between the cricket green and the Calleva Arms pub. We stopped to have lunch at some picnic tables and benches by the green before gradually migrating to the pub in small groups so as not to cause gridlock at the bar. Suitably refreshed, we left the pub via a footpath leading into Pamber Forest. 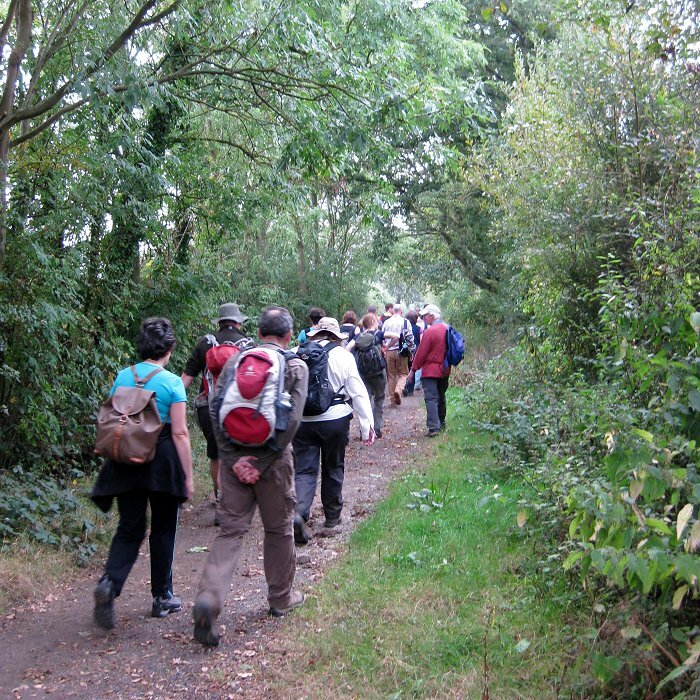 Navigating through the forest, first westerly then southerly on footpaths, we left it heading easterly on a quiet lane. This lane ended at Bramley Road, where we took to footpaths again, through a number of fields. 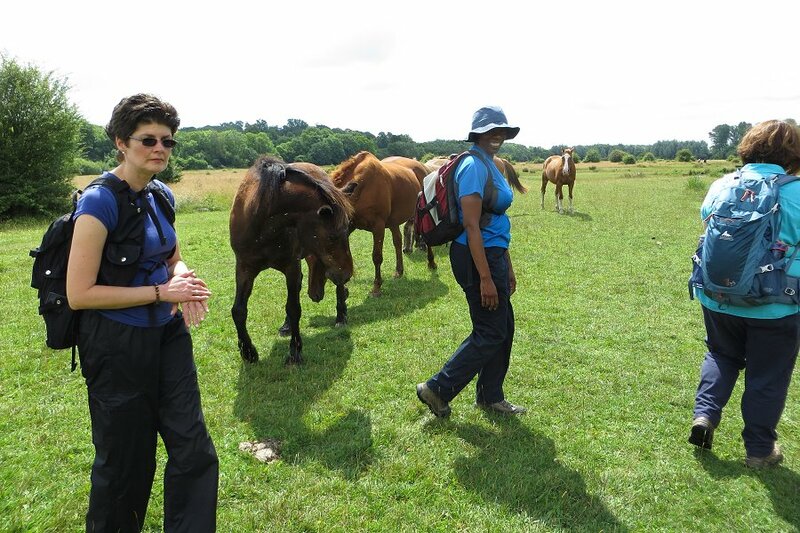 The first was a wheat field and the second was a pasture containing some cows and calves. Restless cows and calves in a field near Calleva Atrebatum. The cows and calves seemed content to ignore us as we followed the edge of the field. The next field also contained a herd of cows and calves, but they were far from contented. They charged around, repeatedly crossing our path and then followed our route into the next field, where they continued to charge about in an alarming way. 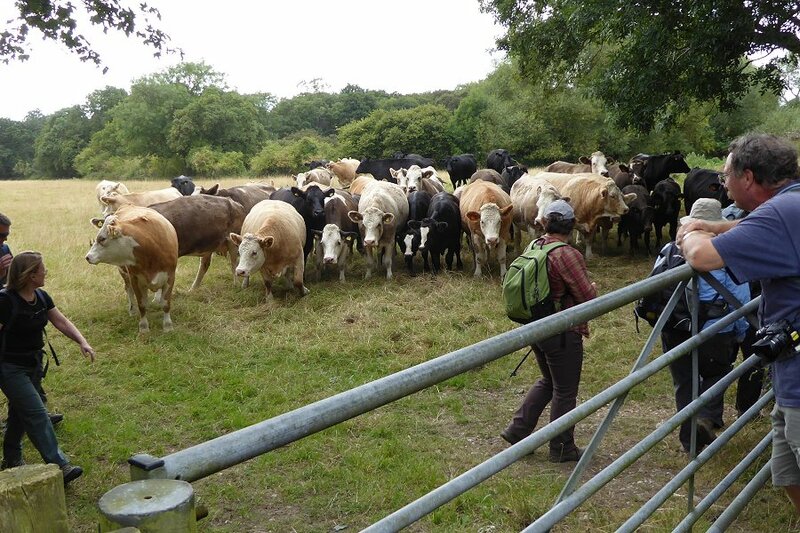 We often pass though farms and pastures on our walks but it is very rare for us to see cows behaving like this. I'm not sure what was wrong. Anyway, we were relieved to leave them behind in the field as we reached the remains of the walled Roman Town of Calleva Atrebatum. The Roman Amphitheatre, just outside the city walls of Calleva Atrebartum. We followed the city wall for a short distance before reaching the West Gate and taking the path through the middle of the town. We passed the site of an archaeological dig before reaching the (relatively) more modern 12th century church of St Mary the Virgin at the East Gate. There was a tea and cake sale on at the church so we stopped for tea and cake. This is the second walk in as many weeks that has had a tea and cake stop as well as a pub stop. 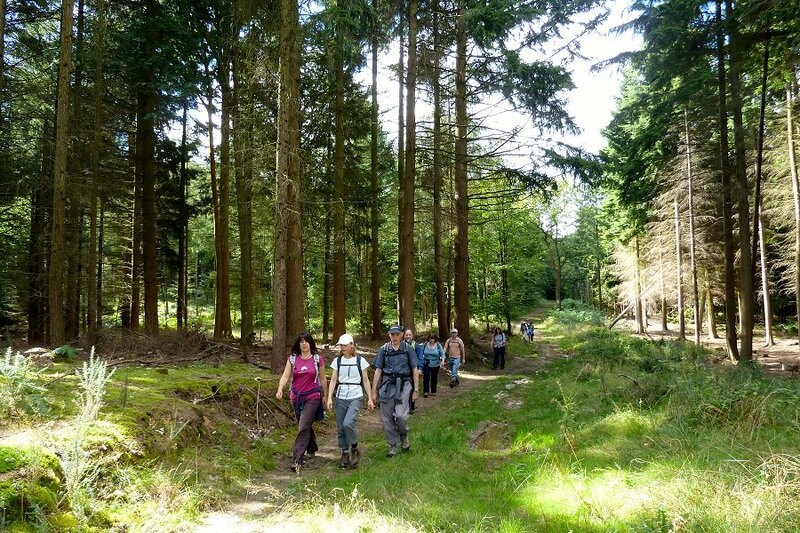 We're in danger of gaining more calories than we lose on these walks! We left the church and followed the road to the nearby Roman Amphitheatre, where we stopped for a look around before following part of the city wall back to the West Gate. From there it was a short walk back to the car park where we had started. See our route on Bing Maps. Thank you to Sue for providing three of these photos and for leading the walk! 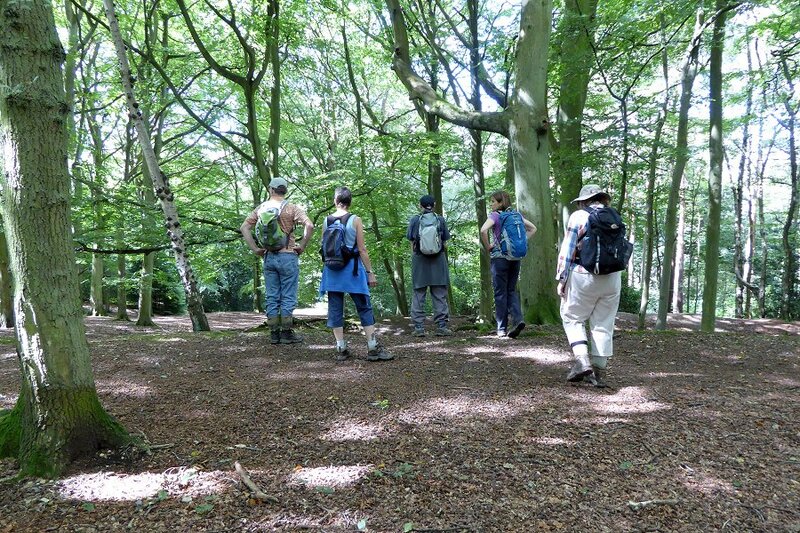 Walking through Cuckoo Pits woods on the Hermitage and Grimsbury Castle walk. 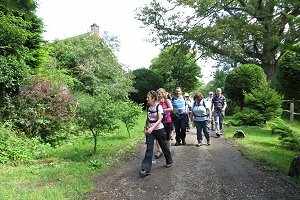 I didn't make it to this 6 mile walk on Sunday 31st August, but eleven other people did - eight regulars and three guests. This short walk was planned by Jane as an easy way for potential new members to try us out, but as a result of a recent injury she was unable to lead the walk. Mike and Alison volunteered to lead it for her, as they know this area well and have led similar walks there in the past. Jane was able to meet up with them at the pub-stop at the end of the walk. After a couple of miserable weeks of cloud, rain and low temperatures, the fine weather had returned, making the walk that much more enjoyable. Also the good weather may have helped impress our potential new members! Thank you to Julia and Sue for providing the photos. 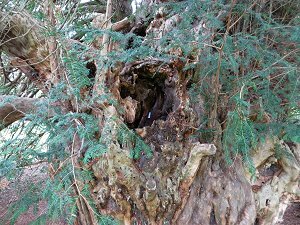 Part of the massive trunk of the Ankerwycke Yew. Someone seems to have posted a note into it. Heading towards the village we took the first turning on the left, Tithe Lane passing a much restored barn and granary. 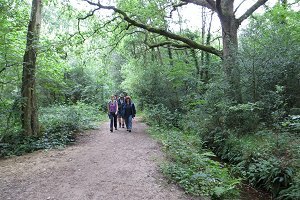 The lane soon turned into a footpath and through the trees were glimpses of Wraysbury Lakes, which began life as gravel pits. 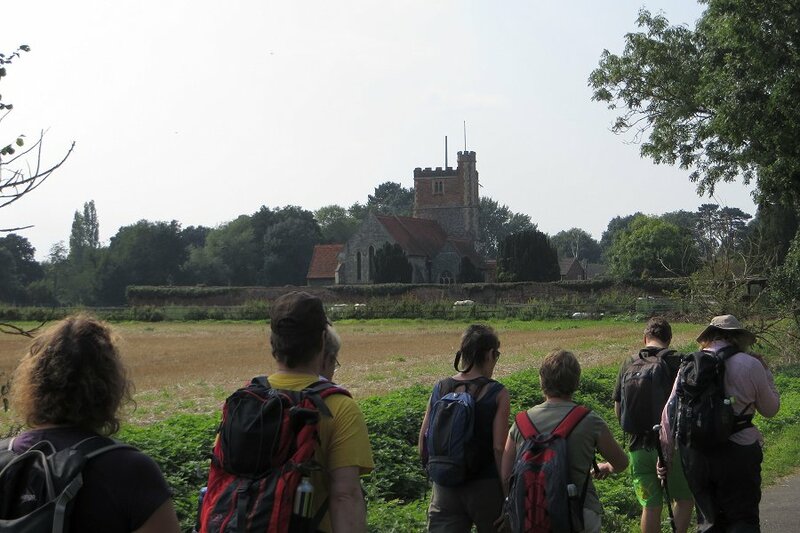 Arriving at the High Street we were faced by the ornate (Baptist) church with a glimpse of Wraysbury Windmill to its rear. Having heard much of this attraction from the locals I was disappointed to learn that it had been built as residence, as recently as 1996, in the style of a smock mill. Before reaching the NT land at Ankerwycke there was a first sighting of the Air Forces memorial at Cooper's Hill on the other side of the Thames. Stopping to look at some bracket fungus growing on a fallen tree in the woods at Ankerwycke. 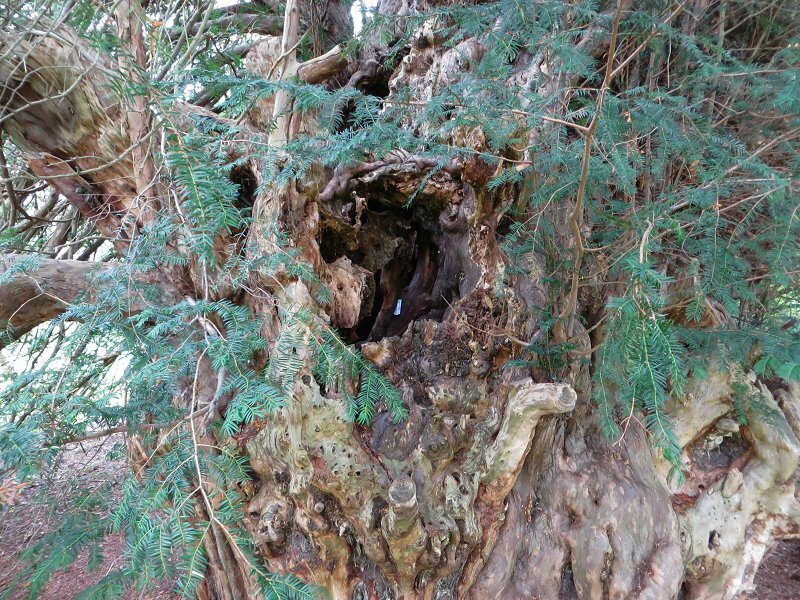 After crossing a dry water course we veered to the left and soon paused for a drink stop next to the Ankerwycke yew. Unless you walk up to inspect its ancient trunk it looks uninteresting. According to some sources it was here, not on the opposite bank, where King John signed the Magna Carta. Heading onwards past the ruins of St Mary's Priory and entering a small wooded area we were treated to the splendid sight of enormous, yellow bracket fungi on a fallen tree. Nearby was the Thames, for the most part hidden by overhanging tree. However through breaks in the trees we had a sight of women paddling a dragon boat, and a few fishermen on the opposite bank at the Runnymede Pleasure ground. A dragon boat being paddled at some speed down the Thames near Runnymede. Another stretch of road walking took us to Hythe End, and after crossing the Colne Brook we turned left to follow the brook, with yet more lakes to our right. 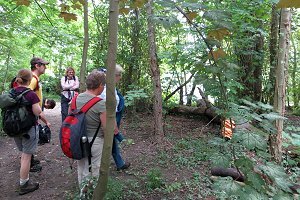 Approaching the railway line, which we crossed, we had our first sighting of Wraysbury Reservoir. The path alongside the branch line was a little overgrown with nettles and care was needed to avoid stepping into the few holes created by burrowing animals. Under the M25, a short stretch of road and we were at the western side of Staines Moor. 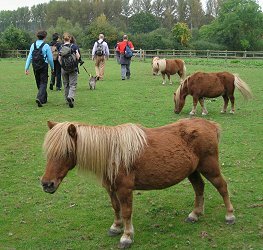 A short walk along a gated access road, which is also a bridleway, yet more water, the Wraysbury River, was to our left. Two kissing gates, with a section of dismantled railway line between them, and we were onto Staines Moor. We chose not to climb up the Butts. Making our way along a rather overgrown board-walk in Stains Common. Instead we crossed a couple of raised board walks, evidence of the very wet nature of this area after heavy rain, and sat next to the River Colne to eat our picnic lunch. Sadly the dogs which were enjoying the river had frightened off the swans and herons before our arrival but we were able to watch the planes just after they had taken off from Heathrow. Northwards, with ant hills, some of which a sign informed us were 200 years old, to the right we crossed the Bonehead Ditch near its confluence with the river and followed a path which eventually led us onto a track alongside the King George VI Reservoir. I was surprised to find that we were being followed by a large vehicle since a bollard prevents entry to this track. With more road walking we skirted the edge of Stanwell Moor village, crossed the river again just below a noisy weir and briefly left the roads behind. 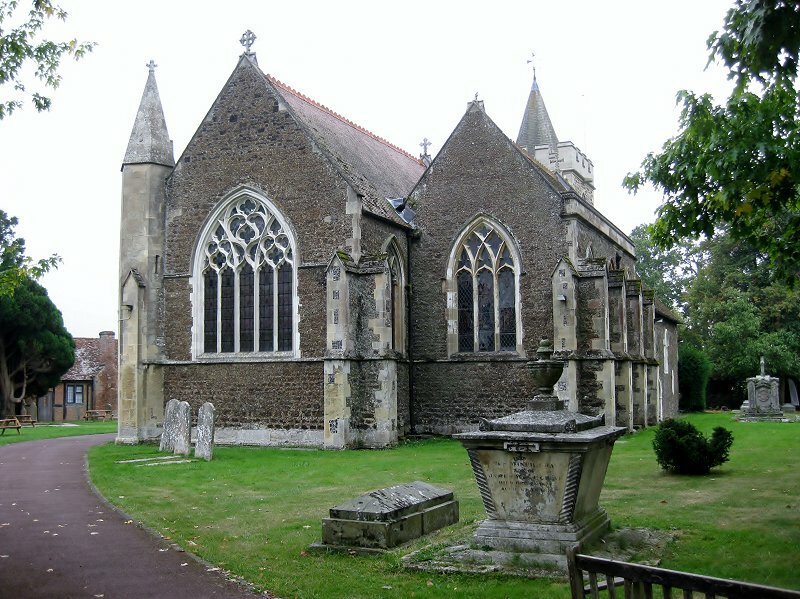 Saint Michael's Church in the village of Horton. The abundant vegetation, flowers, rose hips and indelible blackberries made up for the rubbish along the cycle track which made negotiating J14 of the M25 straightforward. 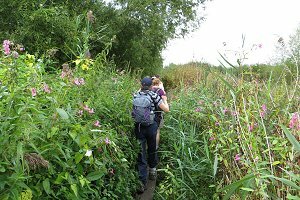 Entering the outskirts of Slough/Poyle, the northern end of Wraysbury Reservoir was on our left, and a short walk along Horton Road took us to the Arthur Jacob nature reserve. More road walking took us over a nameless, but largish stream and a blue plaque informed us that Milton had lived here for a few years. Horton churchyard is home to many ornate headstones. A left turn down Park Lane took us past Heathrow kennels and cattery and brought us to more former gravel pits. The railway line, with its obligatory two high stiles, had to be crossed again before the path brought us to Douglas Lane and back to Station Road. See our route on Bing Maps. I didn't make it to this walk on Saturday 20th September but Kathy, one of the two leaders of this walk, has provided us with this description and these photos. Warfield is an Anglo-Saxon settlement meaning Open land by weir and mentioned in the Doomsday book. 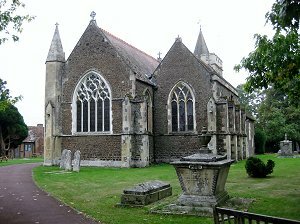 The 11th century Saint Michael's parish church retains much of the later 13th & 14th century features. A number of notable people have lived within the area in the residences of the old Manor House, Warfield House and Warfield Hall. Passing through a field of Shetland ponies near Warfield. There was also a late 18th century brickworks run by the Lawrence family that provided bricks for the Albert Hall, Westminster Cathedral and in restoration works of 10 Downing Street and Hampton Court. 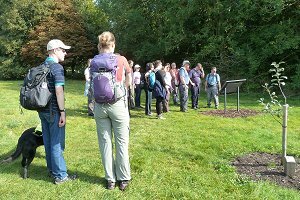 A group of 18 ramblers with two new members set off from Frost Folly Country Park car park. Following a country path down to St Michaels we stood to hear a little history on this picturesque village church before heading through a paddock that had some friendly Shetland ponies. 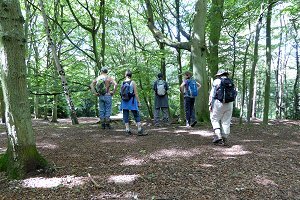 From there we headed down fields, tracks and into the wooded areas of Hogoak Lane and past Chawridge Bank Nature Reserve. Crossing the busy Drift Road we then walked down quiet lanes and onto open fields to join bridleways and past stables, liveries and nearby farms. Stopping for our picnic lunch at the edge of a field in Braywoodside. 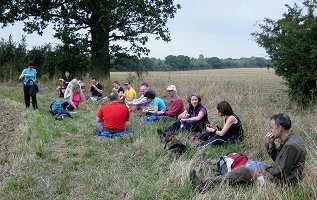 We found a nice quiet spot at Braywoodside on the edge of a field and the sun came out as we enjoyed our picnic. The new trial flight-path from LHR did however disturb some of the quietness of the countryside! Walking through Tickleback Row on our return to Warfield. Following lunch we meandered our way along hedged bridleways and tracks, a few people stopped to pick blackberries, some of which were still ripe. We crossed back over Drift Rd and on into fields with views of The Cut a stream which runs to the Thames via Bray. From here a long straight walk through a leafy byway and the hamlet of Tickleback Row, where we emerged at the Shepherds House pub and where most of the group took some refreshments in the garden before heading back to the car park. 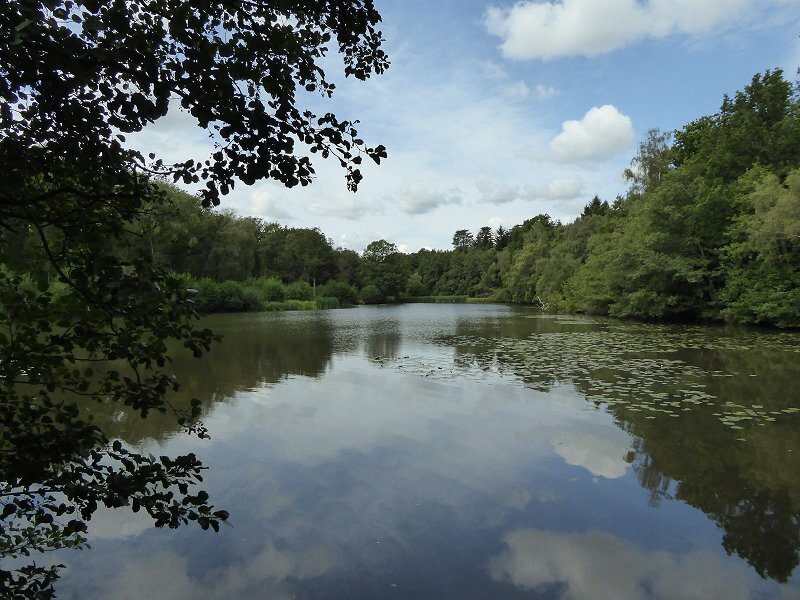 An easy-going, pleasant walk in the unspoilt countryside of nearby Bracknell, with the threat of possible rain/thunderstorm averted making it all the more enjoyable. Looking at a recently planted orchard in Basingstoke's War Memorial Park. Twenty-one walkers, including several newcomers and a guide dog assembled outside Basingstoke railway station in remarkably warm weather for the last Sunday in September. 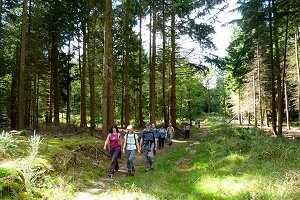 This joint walk with the Berkshire Walkers 20s & 30s group followed the Basing Trail through various municipal parks and some pleasant open countryside. We set off from the station and took an underpass to the middle of the surprisingly green and wooded Eastrop roundabout on the main road! Looking up through the treetops we could see the immense and highly reflective Barclays building. Another underpass took us to a plaza with fountains pulsing around us. 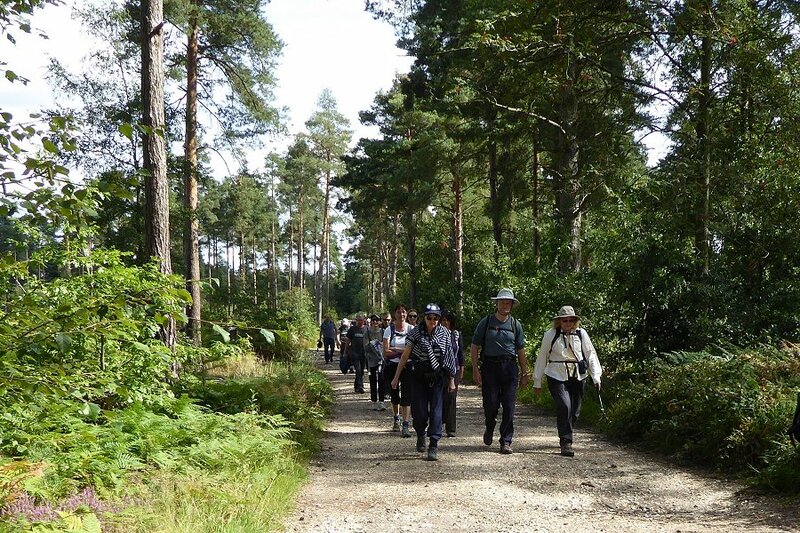 Walking through the Crabtree Plantation with Basingstoke just visible behind us. 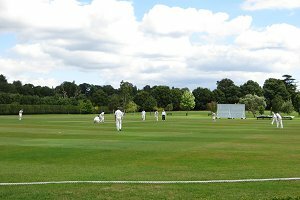 We followed a couple of roads to the War Memorial Park, with its monuments, birdcage and sports facilities. Then we crossed a bridge over the Ring Road and entered Black Dam Park, with its woodlands, ponds and children's play area. Going under the M3 motorway link road, we emerged into the Crabtree Plantation, which despite its name has a large area of grassy open space as well as the trees. The nearby motorway could be heard in the background but was fairly well screened from view. Leaving the Crabtree Plantation we crossed the A30 into Basingstoke Common. 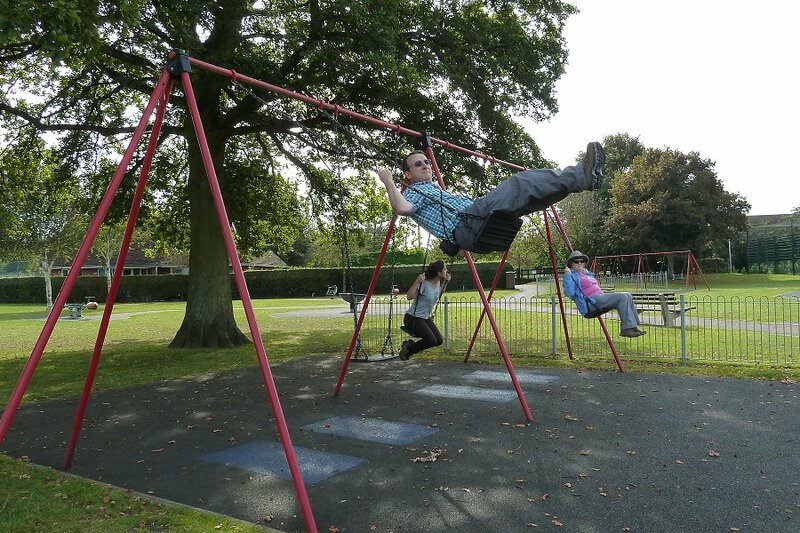 Indulging in some light recreation during our lunch stop in Old Basing. Crossing Basingstoke Common we entered the picturesque and historic village of Old Basing. Oliver Cromwell led his troops here in 1645 during the English Civil War. We stopped for our lunch at the recreation ground on the site of Oliver's Battery Motte & Baileys. There were plenty of picnic tables and benches to sit on. Some of us even had a go on the swings! 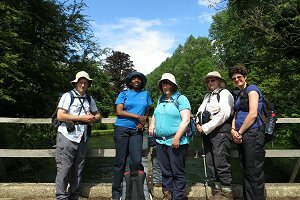 After lunch we crossed the River Loddon and walked through Cowdrey's Down to the Millstone Pub at Barton's Mill, where we stopped for a drink and to use the facilities. Suitably refreshed, we crossed the River Loddon once more, and then followed it as far as the Tithe Barn in Old Basing. 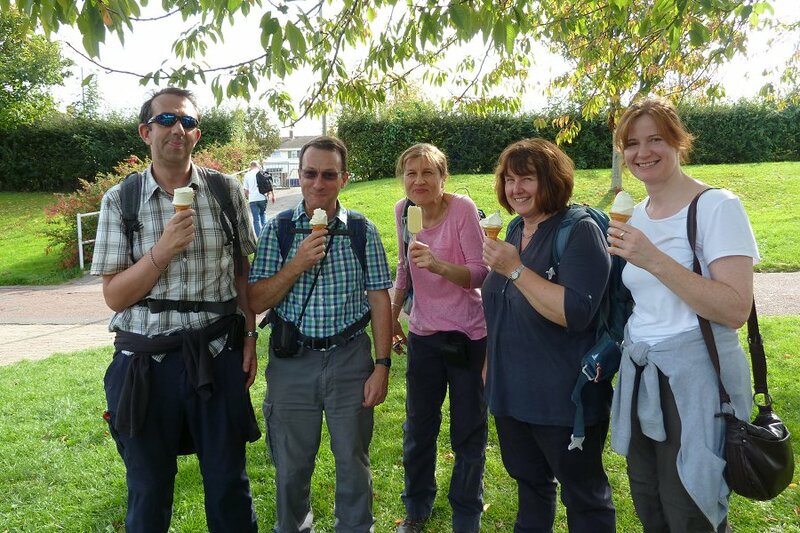 Stopping for an ice cream in Eastrop Park at the end of our walk. 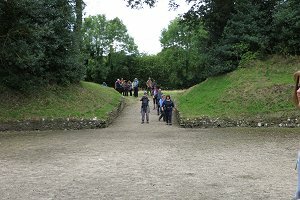 Next we followed a quiet lane past Basing House (ruins) and then through fields to an amphitheatre by Basing Lime Pits. From there we crossed some scrub-land and passed under the Ring Road into Eastrop Park. 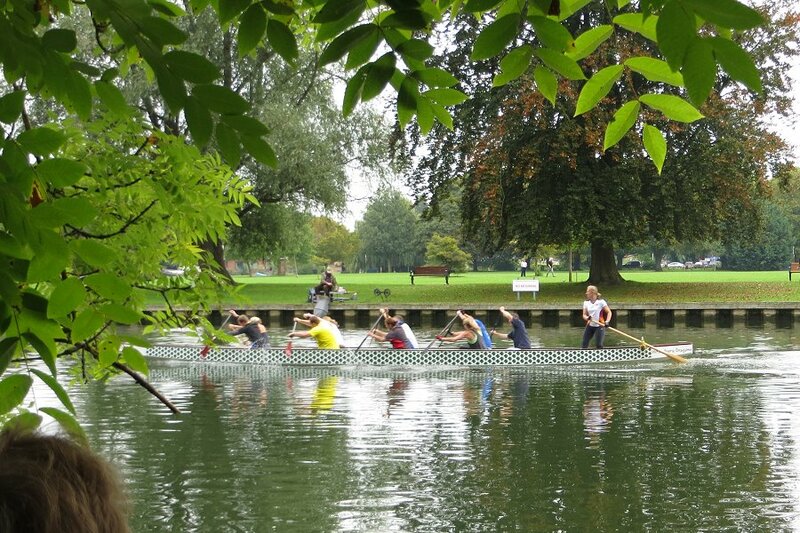 This family-friendly park has a rowing boat lake with fountains and a smaller pond for model boats. It also has a café where we stopped for an ice cream before heading back to the plaza that we had walked through at the start of the walk. This time there were children playing in the water features. We didn't join them. Instead we returned to the railway station via the Eastrop roundabout and its underpasses. This semi-urban walk was a bit different from our usual country walks, but gave us a chance to appreciate the green spaces in a sometimes underestimated town. See our route on Bing Maps.